Kathy has just arrived, rather reluctantly, back in the office after a month exploring southern Chile, with a short foray into Argentina, to Los Glaciares national park, in particular El Chalten and the Fitzroy area. She says “I hadn’t been to El Chalten in southern Argentina, since my tour leading days when it was a small town of just a few hundred people, in its infancy. In those days the gauchos rode their horses through the wide and dusty, streets, to hitch up outside the one and only bar, La Senyera. They were tough looking guys, but their favourite tipple seemed to be Pina Colada. El Chalten was always my favourite part of the tours I led through Patagonia, it was a really special place, wild and remote, with a frontier feel to it, and a stunning mountain backdrop. Returning in April 2017, I found a much larger town with a huge choice of accommodation, restaurants, cafes, bars and shops. The town, that was only founded in 1985, is now well served by pretty much all modern amenities, there is even reasonable quality Wi-Fi throughout. The Wi-Fi is recent and one of our local drivers rather lamented the fact as it meant the sudden disappearance of kids who had until then always played outside. The Cerro Torre and Fitzroy mountains remain as impressive as ever and out on the trails the sheer scale of the landscape dwarfs the trekkers, so there is no sense of crowds. Plus the development of the area has meant opening of new trails and a widening of the options available for visitors. 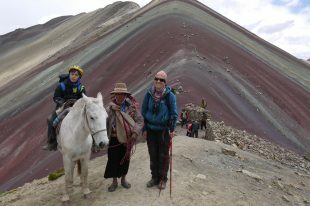 We are happy to organise guides for day walks and to organise longer trekking itineraries to suit. There are a couple of supermarkets and some fabulous bakers in town that can supply you with fruit, snacks, ready-made sandwiches, very tasty empanadas (meat or veg) and pastries – do go well supplied into the mountains as there are no facilities anywhere other than in El Chalten itself. I always take extra supplies as walks can take more time and energy than expected. The two classic treks are to Laguna de Los Tres at the base of Fitzroy and Lago Torre at the base of Cerro Torre, but there are many other trails that are worth exploring and good quality guides that can help you make the most of the area and fill you in on the inetresting geology and mountaineering history as well as point out all the fauna and flora you might otherwise miss. This is one of the toughest walks but also the most rewarding day as it takes you to the lake at the base of Fitzroy mountain. This is a considerably gentler day walk, out and back on an easy path. The trail wanders through forest and takes you to Laguna Torre for spectacular close up views of Cerro Torre. Less popular than the other day walks, this route takes you to a fabulous view point high above Laguna Torre. It is off the beaten track and a superb option for a third trek day, with the added bonus of being able to find marine fossils on the ridge. Just a short drive from El Chalten this is a privately owned reserve with several options for day walks, and a mountain refuge meaning longer options are available too. There is an excellent visitors centre, well-marked trails, and spectacular views of lakes, the ice-cap and the Fitzroy group of peaks. The reserve has been set up to preserve the area and to try to increase the number of Huemul, a native deer. There are far fewer people on the trails in the reserve than on the classic walks above, so a better chance of seeing wildlife and enjoying the forest. Mountain Bike, from El Chalten you can rent a bike for the day or half day, with the option of a lift to Laguna del Desierto and a cycle back (38km) partly on trails and partly on the dirt road – with the wind behind you. Horse riding at Estancia Bonanza, half day or full day options. Kayak on Rio de las Vueltas. A half day trip on sit on kayaks, down the Rio de Las Vueltas. Wet suits are provided. This is a fabulous way to slowly travel through the landscape. 38 km up the river from El Chalten is where the road ends, and Lago del Desierto lies. Cross the lake and you can walk through the forest into Chile (more on this crossing later). There are regular buses to the lake from El Chalten, or take a guided day trip. Once there you can walk to Glacier Huemul a beautiful short hike of an hour or so each way, wander the lake shore or take a scenic boat trip. For an adventurous day that gets you close up and onto a glacier this is hard to beat. Weather and ice condition dependent, if the trip is running it is likely to be a trip highlight. You take a short boat trip to the edge of the glacier followed by an expedition onto the Viedma glacier kitted up in crampons and harnesses. The scale of the glacier is immense and this experience is far removed from the ever popular Perito Moreno ice trekking where you would be with dozens of others. Andreas Madsen was one of the earliest settlers in the area, living at the foot of mount Fitzroy from 1903 to 1963. Today his estancia has been restored and is now an interesting museum with tours each afternoon guided by his great grandson. Tea, yerba mate and biscuits are served too. For a gentle afternoon and to learn a bit of history this is a short stroll from town. This is a 90 minute drive from El Chalten, and we can organise it as a day trip or as part of the journey to El Calafate. The fossil area is extensive and there are huge, whole tree trunks of fossilised Araucaria trees, and even some fossils of dinosaur bone Whole dinosaur fossils have been removed to museums. You wander through the desert type landscape for a couple of hours and picnic in a sheltered spot surrounded by ancient fossils. If you are interested in visiting El Chalten or Patagonia in general, please do get in touch with Andean Trails and we can help make your dream of a Patagonia Adventure come true. PS. This blog gives you some great ideas for the Self guided Patagonia Trek, Fitzroy and Paine W itinerary. The highlight was definitely just how amazing that part of the world is - Patagonia is stunning, I loved it. In particular, I loved the Argentinian side of Patagonia around El Chalten and the hikes we did in that part of Patagonia. Of course, a lot of what will affect a hiking trip is the weather, and I have to say that we had perfect weather on the day with the best viewpoint. The holiday was almost exactly as I had expected it to be, so there was no general high or low points for me, just very good overall. Accommodation overall was of a reasonable/good quality and always clean, all food included was good and ample. All the ground staff were good but a few deserve a special mention, our mountain guide in El Chalten "Sebastion" was very professional and had very good general and historical knowledge of the mountains. Arnolde, our bus driver from El Calafate to Ushuaia was always in the background but at the same time looking out for everyone, he was also a great wildlife spotter. This was exactly the holiday I was looking for so probably would'nt have done anything differently, however if I was to return, which I hope to do, I would spend more time walking in the mountains. thank you guys for managing to salavge this holiday for us, as we had independant flights it was looking like we were going to be spending all our time in Buenos Aires!